Welcome to JenAbbas.com, a web home for adult children of divorce and the official home for author Jen Abbas. Whether your parents divorced when you were a kid or an adult, whether it happened 2 weeks or 20 years ago, you'll find both help and hope here. 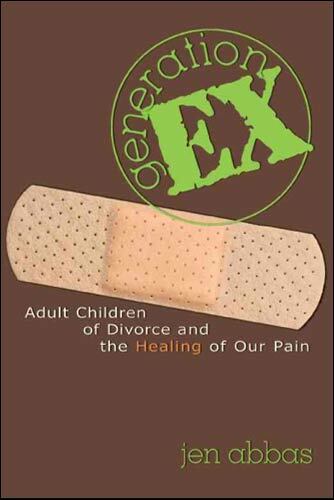 This is also the home for Jen Abbas' debut book on the lifelong effects of our parents' divorce, Generation Ex: Adult Children of Divorce and the Healing of Our Pain, which is available everywhere books are sold. Generation Ex is back in print! Click here to purchase the new edition from FamilyLife. 07.02.07 - Jen's getting married on July 29!!! Look for an updated site after the big event. In the meantime, read all about it here. For the latest news, reviews and interviews, check out Jen's blog. Or, visit Jen at MySpace.com to stay updated on the latest events, speaking engagements and more. Learn more about Jen's writing life by subscribing to her AmazonConnect blog. Lots of great ideas on how to promote your book and market your message. As the author, no one is going to be more passionate about promoting your book than you. This document will help you find your readers.